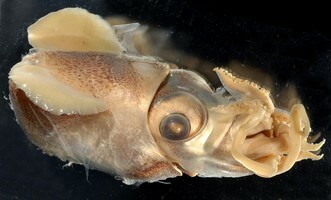 Two species of Heteroteuthis have been described from the South Pacific. H. serventyi Allan, 1945, was taken near Jarvis Bay, S.E. New South Wales, Australia at 35.1°S, 150.9°E and the holotype is small (7 mm ML) and apparently a female. 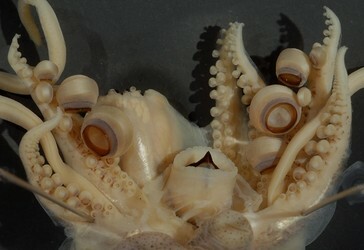 H. hawaiiensis dagamensis Robson, 1924 (elevated to specific level by Nesis 1982/87), was captured off the Natal coast, South Africa, and the syntypes are large (19, 21 mm ML) but also female. The distinctive feature that separates this species from H. dispar/H. hawaiiensis is found in the male. We have seen specimens from near the type locality of both species. Since H. dagamensis has priority, and since we assume that only one species is found in these waters, we accept this as the correct species name. Right arms I and II hectocotylized: Arms longer than left counterparts, with deep joining membrand and swollen marginal membranes on proximal half of both arms with pores and internal white glandular masses. Proximal ventral bilobed projection of right arm I overlaps base of right arm II. Large gland between these arms opens between lobes. Males with few greatly enlarged suckers in the dorsal sucker series on arms III: Sucker 10 about 4-5 times diameter of sucker 9; enlarged suckers of dorsl series much larger than counterparts in ventral series but latter still enlarged. Arms IV with 3-4 sucker series near tips of arms. Figure. Oral view of the brachial crown of H. dagamensis 16 mm ML, mature male. 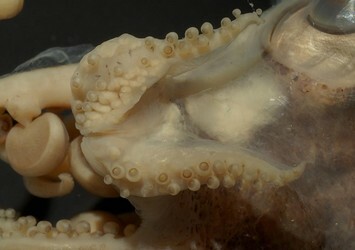 Note that the large suckers on arms III are in the dorsal series and alternate with small suckers in the ventral series. Drawing by A. Hart. Figure. Oral view of the arms of H. dagamensis 19 mm ML, male Left - Full arm crown. Note that right arms I and II are folded dorsally. 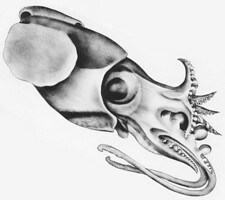 Right - Dorsal view of the head showing the distal region of right arms I and II. Photographs by R. Young. Arms I and II with bare arm tips. Arms IV with 2 sucker series at arm tips. Figure. 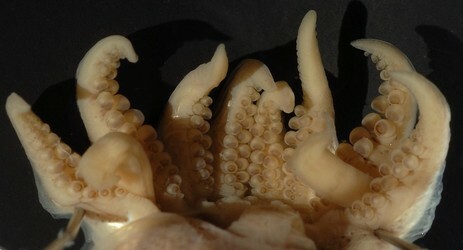 Left - Brachial crown of a mature female H. dagamensis 16 mm ML, arms I are in center. Right - Left arms I-III of a female. Drawing by A. Hart. More details of the description of H. dagamensis can be found here. 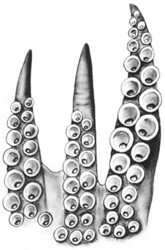 At present the only character that distinguishes H. dagamensis from H. dispar/hawaiiensis is the arrangement of large suckers on arms III of males. We have not made detailed comparisons of these species to search for additional characters. The description presented here is made from notes taken many years ago. Type locality - Off the Natal coast, South Africa. The specimen we photographed came from the South Atlantic off South Africa at 36°S,11°E and off South America at 37°S, 53°W. The specimen drawn came from off New Zealand at 40.1°S, 168.1°E. 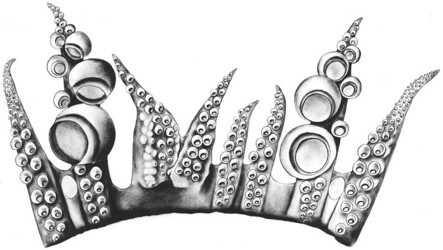 Page: Tree of Life Heteroteuthis dagamensis Robson 1924. Authored by Michael Vecchione, Richard E. Young, and Clyde F. E. Roper. The TEXT of this page is licensed under the Creative Commons Attribution-NonCommercial License - Version 3.0. Note that images and other media featured on this page are each governed by their own license, and they may or may not be available for reuse. Click on an image or a media link to access the media data window, which provides the relevant licensing information. For the general terms and conditions of ToL material reuse and redistribution, please see the Tree of Life Copyright Policies.